Premium products from the Mesquite Roasted Company are created using pure all natural products that are free from chemical additive. Our premium coffee is fire roasted over open mesquite wood fires. We are not just the makers of Mesquite Roasted Coffee products but we are customers too. We use our own products every day. Mesquite Roasted Coffee is roasted to a Full City Roast level. Mesquite Roasted Coffee is kept fresh to the last bean with our "no scrimp" top of the line packaging. Original Mesquite Roasted Coffee is uniquely the “real deal” in wood fire roasted coffee…because we hand roast our flagship coffee beans in mesh baskets over open mesquite fires. Fire-roasted Mesquite Roasted Coffee cooling down. Direct flame wood fire roasting is a delicate balancing act of the coffee roast master's skill with intense heat of glowing wood embers. Fire roasting the only way to get that perfect cup of old west pure coffee taste with just a hint of mesquite wood roasted flavor! Our coffee is packed just hours after roasting in the finest foil-mylar air-tight coffee bags on the market. This keeps the fresh roasted coffee away from flavor robbing oxygen. We've even included a zipper in our bags so the freshness stays in until the last bean is used. We open fire roast our coffee. 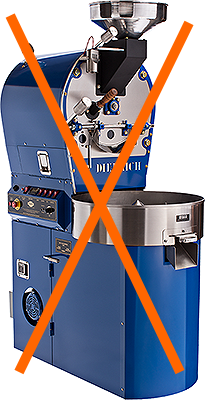 Roasting coffee in sealed metal gas fired drums or hot air tumblers used by robot roasters simply cannot duplicate the smooth lightly smoked taste of mesquite fire roasted coffee. Our popular Mesquite Roasted Grilling Rub made with 15% coffee is great on pork loin steaks. Low salt, MSG free, gluten free. Grilling Greek Spice Mix super flavor enhancer for light meats like chicken, fish, and pork. MSG free, gluten free, all natural. Our Roasted Chili Spice Mix makes you a chili expert. Smokey flavor, mild heat, gluten free, and MSG free. We love the savory taste that wood smoke adds to food so much that we pretty much grill outdoors almost every day. The first smokey product we introduced was Mesquite Roasted Grilling & Blackening Rub made with 15% Mesquite Roasted Coffee back in 2009. To share the grilling love even more, we have been busy infusing that smokey flavor into all sorts of foods. Stay tuned to our blog of follow us on FaceBook to learn of new product announcements. This grilling rub is designed to take on the high heat of grilling and pan blackening cajun style while imparting a wonderful toasty flavor to most meats. Original rub is still one of our most popular products. Grilling Greek Spice Mix is one of those "wonder" mixes. This spice recipe really was given to me by Greek immigrant "γιαγιά" (grandmother) as she was teaching me to cook her dishes. It's 12 different spices and seasonings that work together perfectly to make the taste of lighter colored meats like pork, fish and chicken, and vegetables explode with flavor. It does not take much. Chili Spice Mix is a really great spice bundle we put together based on a family restaurant chili recipe that will make 'most anybody a chili expert. Just brown coarse ground quality chuck or round beef in a pot and add our chili spice mix. continue to brown just a few seconds more to activate the spices. The wonderful aroma will tell you when it is time to add water and bring back to a very slow simmer. Shortly you have a great pot of chili the whole family can enjoy. Our Chili Spice Mix was originally designed to make perfect "purist chili" (just pure meat chili). We have used this spice blend with beef, venison, pork and turkey blends as well. It all made great chili. And if you are not a purist try adding beans, tomatoes or roasted green hatch chili.